Huffington Post has summarized some striking successes by the recent state government in Minnesota (link). 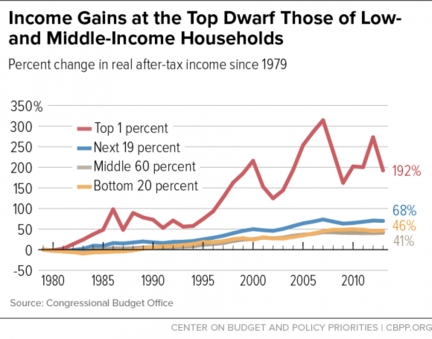 Abandoning the "trickle down" economics of former Gov. Pawlenty, the state raised income taxes on wealthy households and increased minimum wages to a level comparable to that in Washington. The result has been a reversal of the state's economic fortune from stagnant to expansive. The reason for this success and for the failure of tinkle-down is a fairly well understood principle of complex systems called feedback. Newton's observation that a process once in motion tends to remain in motion, unless acted upon by an outside force has applications beyond physics. In economic systems, if an outside force tends to accelerate distribution of funds to a majority that has a propensity to spend or to create new businesses, then any given amount of income will be re-used often, creating new wealth and reducing inequality. Conversely, if an outside force tends to concentrate income among even a minority that tends to conserve (read "hoard") it (does the phrase "preservation of capital" ring a bell? ), then income will be sequestered or spent on luxury goods and will not be available for development, leading to greater inequality. In an oligarchical society, one in which a small number of powerful people make rules for others, there is a historically clear tendency to choose the latter course. This manifests itself as “cut taxes” campaigns, reduction of social services and an increase in funds directed to authoritarian control, such as more police and military expenditures that are not driven by external threat. More guns, less butter. In a democratic society, one in which the maximum number of people participate in decision making, there is a countervailing tendency to choose a redistribution strategy. This results in higher taxes, but the increasing wealth and power of the common family generally causes increase in spending on education, infrastructure and social services like old-age assistance and medical care. Marginally fewer yachts, massively more teacher’s aides. Note from the article that only modest changes in income distribution have a large effect in either direction. As they might say in Hollywood: No middle class or working people were harmed in the production of Minnesota’s movie. It's pretty easy to see the effects of political intervention by government. The adjacent graph (Source) shows the redistribution of income to the wealthy that has progressed under some administrations and slowed under others. I leave it to you to assess which party is (R)esponsible for the (R)egressive trends.